President Trump wants to take the economy back to the 1930s, imposing a series of tariffs that threaten a full-blown trade war. 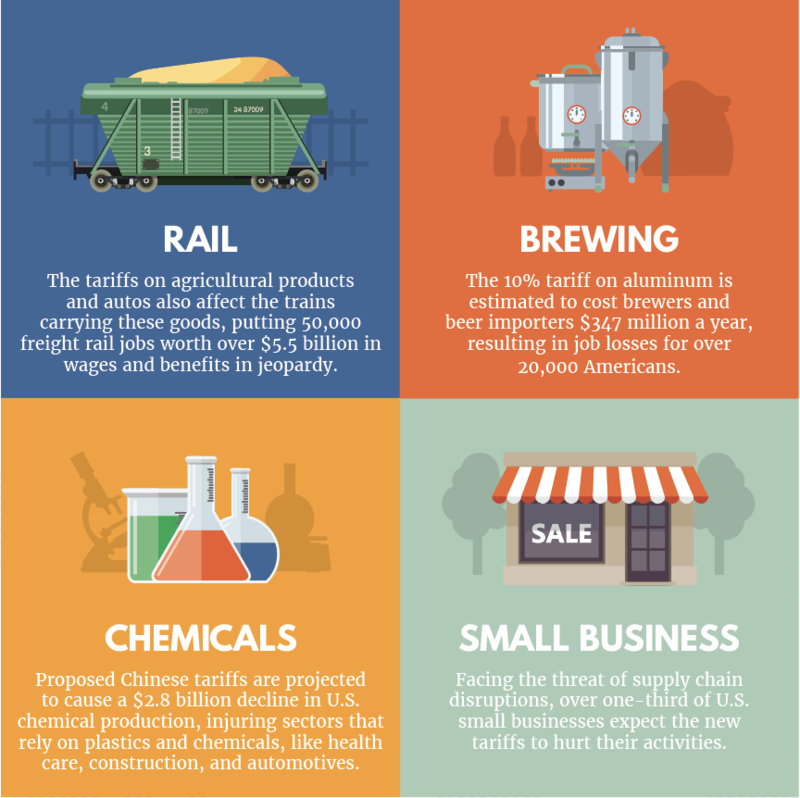 Much has been said about the impact of tariffs on the manufacturing, retail, and agricultural sectors. Here are four additional industries, flying more under the radar, that are also at risk under an escalating trade war. © Third Way 2018. Free for re-use with attribution/link. Rail: “Report: Freight Railroads and International Trade.” Association of American Railroads, March 2017. Available at: https://www.aar.org/wp-content/uploads/2017/12/AAR-Freight-Railroads-International-Trade-Report-March-2017.pdf. Accessed April 16, 2018. Brewing: McGreevy, Jim. “Press Release: The Beer Institute condemns President Trump’s announcement to impose tariffs on aluminum imports next week.” Beer Institute, 1 March 2018. Available at: http://www.beerinstitute.org/press-releases/beer-institute-condemns-president-trumps-announcement-impose-tariffs-aluminum-imports-next-week/. Accessed April 24, 2018. Chemicals: Dooley, Calvin. “Statement for the Record, House Committee on Ways and Means: Effects of Tariffs Increases on the U.S. Economy and Jobs.” American Chemistry Council, 12 April 2018. Available at: https://waysandmeans.house.gov/wp-content/uploads/2018/04/20180412-Testimony-Cal-Dooley-Testimony.pdf. Accessed April 17, 2018. Small Business: Simon, Ruth. “From Wisconsin to Connecticut, Small Businesses Feel Pain of Tariffs.” Wall Street Journal, 16 April 2018. Available at: https://www.wsj.com/articles/from-wisconsin-to-connecticut-small-businesses-feel-pain-of-tariffs-1523793600. Accessed April 17, 2018.